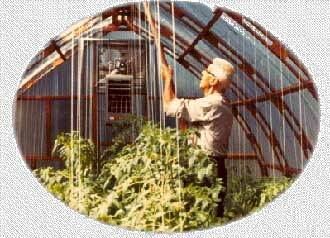 The Gothic Arch Greenhouse is one of the strongest forms known to man and is unaffected by extremes of snow and wind. 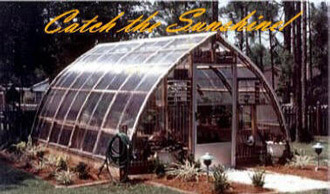 The eye-catching design of the Gothic Arch Greenhouse compliments all architectural styles. Because of the high profile of the ridge, the Gothic Arch Greenhouse allows for taller specialty crops such as tomatoes and cucumbers as well as many tropical trees. The one-piece, monolithic construction of the curved roof and sides allows for a faster and easier installation. 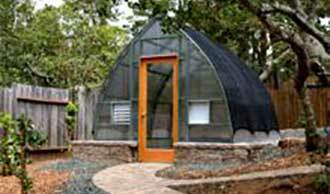 Because of the flexible design of the Gothic Arch Greenhouse, you have many foundation options. From installing the greenhouse directly on the ground, to raising the structure on a high foundation wall, the height of this structure is your choice. Each Gothic Arch Greenhouse is hand-crafted by our master craftsman. Gothic Arch design encourages condensation run-off. Structural Members: Heart Cypress prefabricated Gothic Arches, 2” x 2” purlins, 1” x 2” filler strips, 1”x 4" Ridge Boards, 2"x4" End Framing. Covering and Accessories: Roof, front and back panels are either a Corrugated Polycarbonate, or a 8mm Twin-Wall or Triple-Wall clear Polycarbonate. Note: A minimum 2” x 6” pressure-treated base plate is required. The 12' wide model requires a one foot high min. foundation. Environmental control system packages are available for our Gothic Arch Greenhouses - please contact our sales office to discuss your requirements.